Three years ago, I released a list of the five best horror films in honor of Halloween. However, three years is a long time and I am certainly not the same person I was back then. Naturally, both my opinions and taste have changed since then. In 2009, I hailed “The Silence of the Lambs” as the best horror film ever made. I admit that I have never been the biggest fan of horror films. Zombies and slashers have never quite done it for me. So I think it would be more appropriate to say that this new post is about my favorite horror film. Seeing as I have yet to watch “Night of the Living Dead,” I don’t feel totally qualified to judge which horror film is the absolute best ever made. While I still consider “The Silence of the Lambs” a masterpiece, I have come to realize that “Rosemary’s Baby” is truly my favorite horror film of all time. One of the biggest complaints made against of modern horror films is how the genre has substituted true suspense for blood and guts. Maybe that is why the horror films which effected me most usually have a supernatural element to them. Ironically though, I hate “The Exorcist.” Giving a character powers that they do not understand and cannot handle can say a whole lot thematically. For example, in “Carrie,” her telepathy is partly a metaphor for her ignorance of her journey into womanhood. “Carrie” does not get enough mentions in top ten lists. “Rosemary’s Baby” isn’t even that frightening throughout its running time. Then again, there shouldn’t have to be someone hiding behind every door in order to make something scary. A scary idea can be more frightening than a few cheap screams. “Rosemary’s Baby” is also one of the films that proves that Roman Polanski is a master filmmaker. Few directors have ever been so bold as to view humanity as so overwhelmingly dark. With the exception of “The Pianist,” the endings to most of Polanski’s films are devoid of optimism. However, they are never devoid of meaning. The film is set mostly in one location. More horror films should use less locations, as giving characters less places to go for safety can make a story all the more chilling. The film centers around certified New York yuppies Guy (John Cassavetes) and Rosemary (Mia Farrow) Woodhouse who move into The Dakota. The Dakota would become the sight of a real tragedy 12 years later, as it was the home of John Lennon, and he was murdered just outside of it. One scene in the film showing a dead body just outside the building feels all the more eery when seen through the lens of history. Guy will do anything to make his acting dreams a reality, and he may or may not have made a deal with the Castevets to transform Rosemary’s seed into the son of Satan. 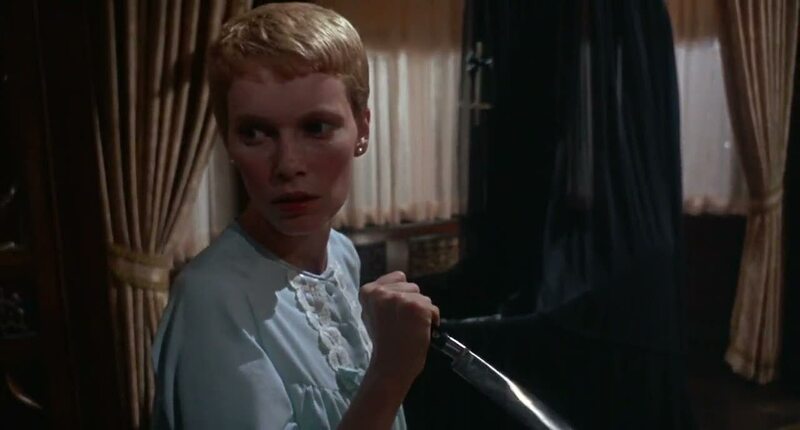 Besides one scene early on in the film which is presented with a nightmarish quality, “Rosemary’s Baby” is mostly grounded in reality throughout. It is also a detective story, with Rosemary investigating her own pregnancy and trying to find out whether her deepest fears are actually all too real. I am not sure how this film was advertised when it was first released in 1968, or whether people knew what the ending would be like going into it. I do not believe saying this is a spoiler, but anyone going into this film would automatically believe that Rosemary is right in her suspicions. If she wasn’t, then there wouldn’t be a film at all. Keeping that in mind does not managet to ruin the power of “Rosemary’s Baby” in any way. “Rosemary’s Baby” possesses the greatest trait of American films from its era: building up and up and up to a devastating conclusion. Letting things sizzle for longer than they should always leads to great results. The unseen is most terrifying, and that is why we are kept in the dark for so long about this Satanic mystery. Many horror films play on the idea of how frightening the unseen can be. What makes “Rosemary’s Baby” so unique is the way in which it plays on common fears. “Rosemary’s Baby” asks whether or not we can really trust the people who are supposed to help us unconditionally, such as our family, friends, doctors, and neighbors. 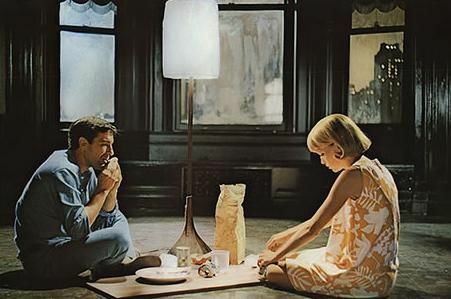 In true Polanski fashion, “Rosemary’s Baby” shows that even our loved ones could be working against us because human selfishness knows no boundaries. Polanski’s films always center around one character who are pulled into evil despite never wanting to be a part of it. 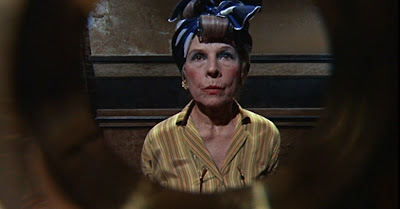 The final shot of “Rosemary’s Baby” is both haunting and strangely sublime. Rosemary is that moral center, and she comes to grips with the idea that even if the world were ruled by absolute evil, evil would not be able to exist without love. In Polanski’s eyes, a world without love is more terrifying than staring Satan directly in the eyes. “Rosemary’s Baby” may be so unforgivingly dark, but there is a reason that I want to keep revisiting it. It is a continuously engaging story that is never ruined by knowing the twists. The script, based on the novel by Ira Levin and adapted for the screen by Polanski himself, shows Polanski’s overlooked gift for humor. “Rosemary’s Baby” is populated by an array of colorful New York high society stereotypes that nearly border on satire. I have not read the original source material, but I wouldn’t be surprised if Polanski crafted many of these exaggerated characters himself, as he always enjoyed spinning our views on the wealthy. Polanski had a reputation for being difficult to work with, but it seems as if his boldest decisions usually end up being for the better. If it wasn’t for Polanski’s change to the ending of Robert Towne’s “Chinatown” script, that film might have been just another detective story. Believing in the existence of a demon child might seem ridiculous, but the world created by this film is so well crafted that I actually felt stupid believing that the opposite could be true. People seem to only want to talk about horror films around Halloween. “Rosemary’s Baby” is perfect for any time of the year. Because it is as frightening and daring today as it was 44 years ago, it remains timeless in every sense of the word. People please tell me, which horror classics are your favorites? Which ones do I still need to watch? This entry was posted in Carrie, Halloween, Horror, John Cassavetes, Mia Farrow, Movie Review, Roman Polanski, Rosemary's Baby, Ruth Gordon on October 31, 2012 by ian0592.